We get a fresh supply of kids pool toys every spring. If we gear the toys to the kids' current interests and age we find that they are winners and provide hours of cheap entertainment. 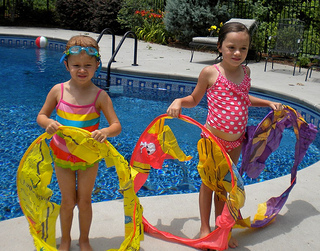 There are several versions of pool hoops available. These are pirate themed ones. The weights keep them sitting on the bottom of the pool. Kids love swimming through them. One swimmer who was just learning to swim under water became "fearless" when we set out the hoops for her. Set them at a depth that is comfortable for your swimmers. Then set them apart again at a distance that matches the swimmers ability. Sometimes we added a trinket or money to gather up after the last hoop for added incentive. 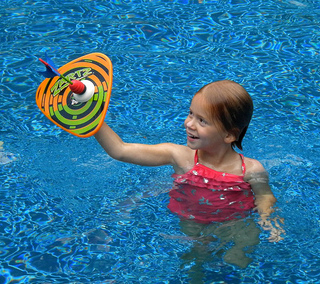 The game of Zartz is a big hit at our pool. Two plastic mitts catch an arrow that's thrown up into the air. 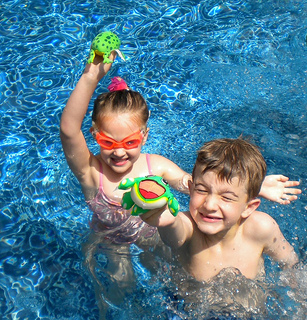 Kids 4 and older can play this swimming pool game and be successful which is what makes any pool game fun. Get a set of 2 so that 4 kids can play at one time. Kids loves splash balls - no matter what shape they are. 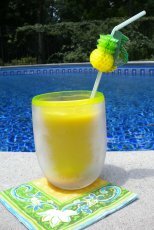 We used frog shaped ones we found at our local grocery store for our frog themed pool party for games and then as take home favors. Let me tell you the kids were asking, "Can we take the splash balls home with us?" Use them for games and/or for party favors. 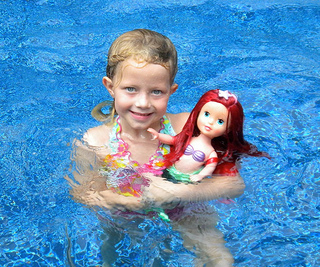 This birthday girl loved her Little Mermaid that could actually" swim in the deep seas." Animal shaped inflatable toys keep kids entertained as they try to stay on the float by themselves or with their friends. 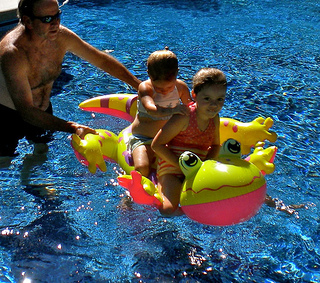 These floats come in all sizes and shapes from lizard ones like this one to shark, frog or whale shaped ones. Some new floats now have a mechanism that prevents tipping. 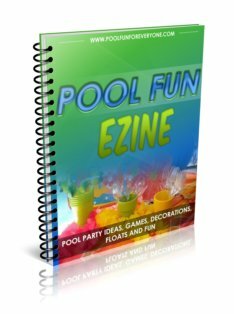 Check out the assortment of pool float toys at Inflatable Pool Toys. 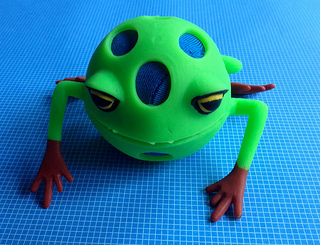 This dive toy is called Bubba - the Bottom Feeder. The idea is actually quite fun. Set the net looking fish on the bottom of the pool. Keep the orange fish on the side of the pool. The swimmer gets one fish and feeds Bubba then comes back up and gets another fish to feed him. Eventually Bubba gets enough fish inside of him to make him float to the top. 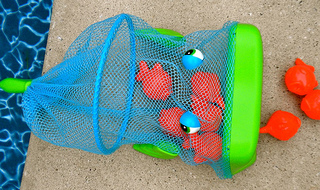 This is no ordinary splash toy - kids love the shape and color as well as throwing him around the pool. He kind of bounces and skips across the top of the pool. 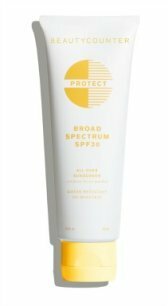 Use him at the pool, the lake or the beach. 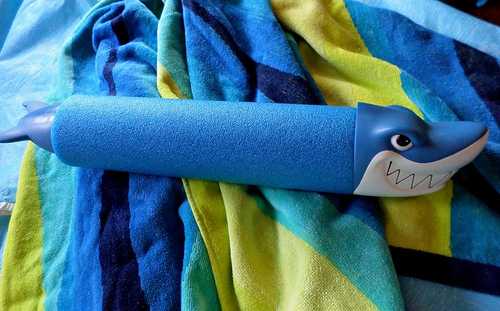 This pool toy appeals to kids of all ages. Max Liquidators with a shark head means there is lots of squirting going on. So if you don't want to get wet, don't get near the pool when this guy is around.